2015 Kawasaki Brute Force 750 4x4i. Picture credits - Kawasaki. Submit more pictures. Powered by a 749cc, 90-degree V-twin, the Brute Force� 750 4x4i serves up the perfect recipe of amazing torque and impressive strength to devour just about any obstacle the trail will throw at it. Kawasaki�s flagship ATV showcases the trickest technology in everything from its dual-range four-wheel drive to self-repairing radiator circuit breaker. Ask questions Join the 15 Kawasaki Brute Force 750 4x4i discussion group or the general Kawasaki discussion group. Bikez.com has a discussion group for every motorcycle. Here you may find answers to common questions about the model. If you do not find what you are looking for, you can ask questions. 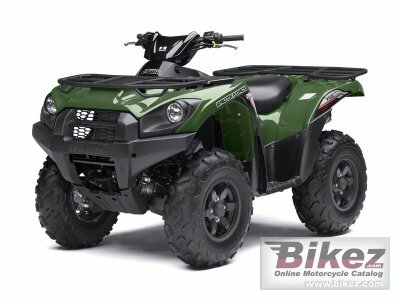 Try out the 2015 Kawasaki Brute Force 750 4x4i discussion forum. You can sign up for e-mail notifications when other users answer you. If you have information about any technical issue related to this motorcycle, please leave a comment for other riders.